One of the developments of late twentieth-century railroading that had a substantial impact was the idea of unit freight trains: trains consisting of one kind of cargo, going between two locations without being rearranged in between. This wasn’t really a new concept, as unit trains for perishables, coal, ore and other commodities had existed for a long time. But as the cost of labor increased, and local freight was largely lost to trucking and other transportation modes, unit freight, and in particular containerized cargo, came to dominate the railroading scene. This was true around the world, but particularly the case in Japan. 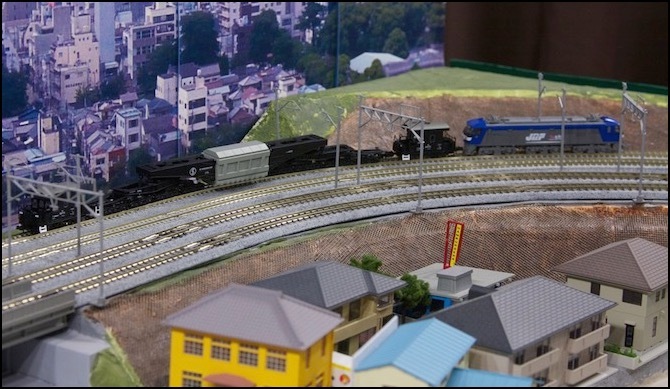 Japan still has mixed freight trains, but unit trains of containers and other commodities are dominant now and most freight yards have been closed, due to the decline in other types of freight. 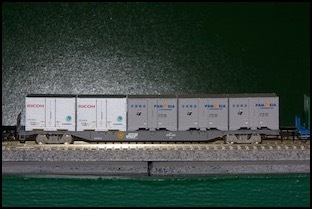 Note: Japanese freight cars are identified by two or three-character identifiers in katakana symbols. For example “コキ”, read KOKI, is the one used for ordinary flat cars, and “タキ”, read TAKI, is used for tank cars. 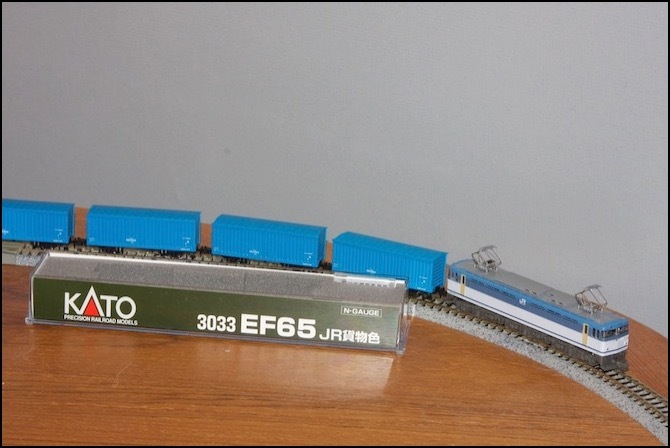 See the Prototype Freight Cars page for more about the kinds of freight cars in use in Japan and their designations. 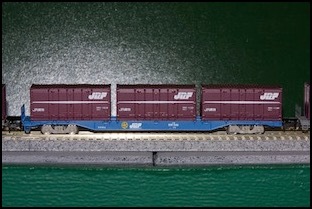 For more information on prototype unit freight trains, now almost the only kind left, see the Unit Freight and Express Freight pages. The typical Japanese container train carriers domestic containers. These vary somewhat from the international standard (ISO) 20-foot and 40-foot containers, typically being smaller and most are not designed for stacking. ISO containers are also transported, particularly to and from port facilities, but most containers are designed to meet domestic size requirements. The most common container is the “twelve-foot” container, which comes in a variety of types, the most common being the “19D” (where 19 is the capacity in cubic meters). And yes, it’s described by its length in English units as a “12 foot” container, even though Japan is on the metric system and the volume is expressed in cubic meters. 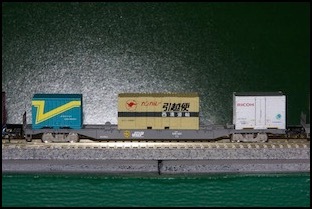 A variety of flat car designs have been used for containers over the years, the most common today are probably the KOKI 104 and KOKI 106 designs. Both are rated for about 40 metric tons and a top speed of 110 kph, and both are capable of carrying for ISO-standard and domestic containers (the KOKI 104 did not originally support ISO containers, and not all may have been modified to support them, but some have). 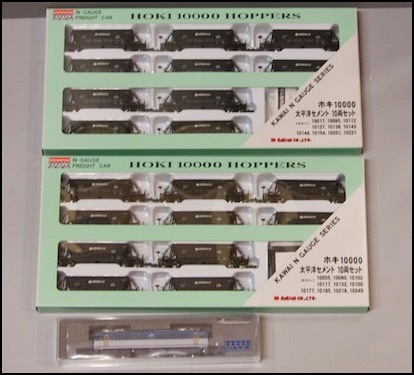 I have a set of sixteen KOKI flat cars: ten of the KOKI 106 (eight of Tomix 2769 in gray and two of Tomix 2768 in blue), as well as six of the KOKI 104 (Tomix 2778 in blue). 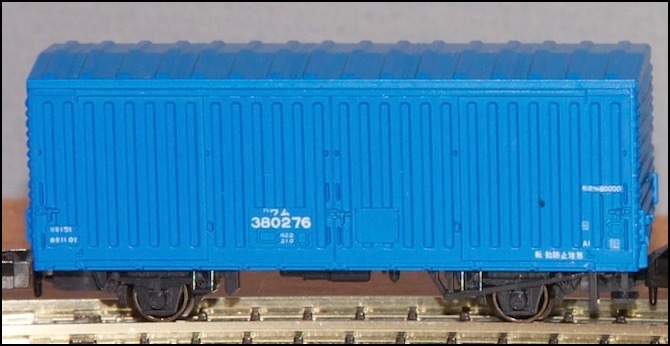 These come without containers, except for Tomix 2768 which came with 30-foot domestic containers, but containers that snap onto the flat cars are available from Tomytec, Kato, Hogakuraku, and other suppliers. Below are some representative examples (I didn’t photograph all of them because a couple are essentially duplicates). Included in this are a couple of “Tetsudou Musume” (lit. 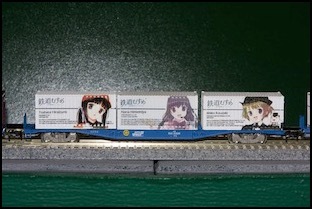 “railway daughters”) containers, with manga-style drawings of cute female characters. Although these don’t represent real prototypes, there are real containers decorated with anime or manga characters, so I’ve used these as representative of the “cuteness” sometimes found in the most unlikely industrial parts of Japan. There is a large petroleum port in Kawasaki, and unit oil trains from and to there are a common site, particularly on the Chūō Main Line west of Tōkyō. 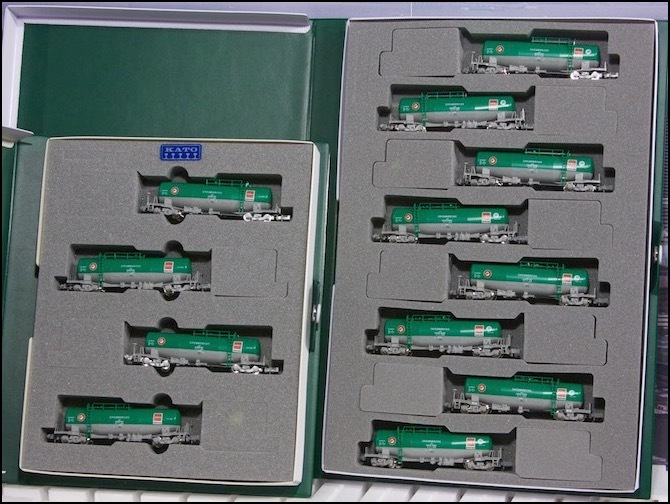 I have a twelve-car train of green TAKI 1000 tank cars (a total of twelve, eight from the Kato 10-825 set plus four of the 8037-3 single-cars). Although the four single cars share the same number, this isn’t apparent unless you have a very close-up view. 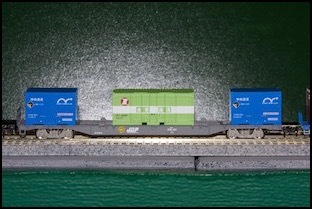 The Super Rail Cargo M250 Express is a specialized Express Freight train. 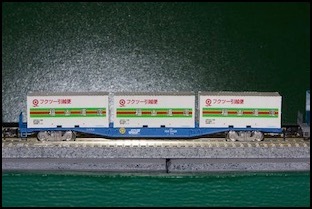 It is a fixed set of 16 cars (4 motorized, 12 flat cars) carrying a total of 28 30-foot containers belonging to an Express company on a fixed route from Tōkyō. 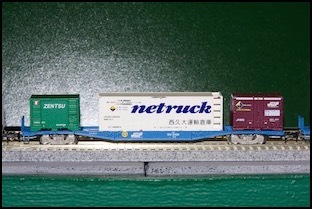 The model (Kato 10-565 two cabs and two trailer-cars (motorized), 10-566 4-car expansion, and 10-288 8-car expansion), uses a single motor, in one of the cab cars. The containers are removable, but on the prototype normally all would be present and identical. 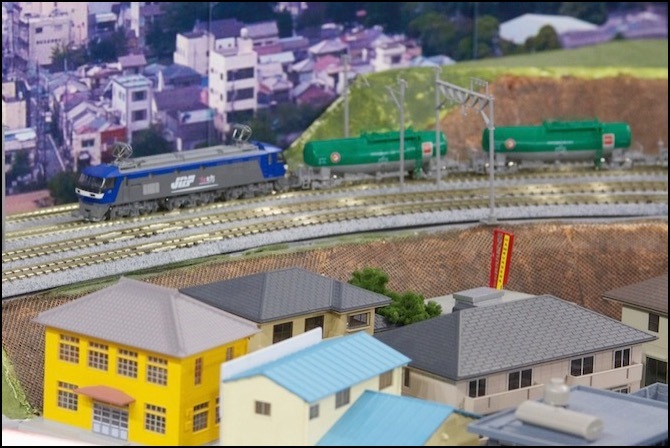 Japan experienced the same loss of rail freight to other modes as did other industrialized countries. By 1986 total freight tonnage, including containers and other unit trains, was just one-third of what it had been in 1960. Boxcars came in a number of specialized series, but after 1960 these were largely variations on the WaMu 80000. You can find a list of these on the Japanese Wikipedia page for the 80000 (Japanese, use Google to translate). The 280000 series produced from 1975 to 1981 (8,500 units) was a significant update, and the basis for most later variations. The 280000 cars were originally painted brown, and some remain in use (often with the addition of a white stripe) as railway maintenance vehicles, including storage of equipment for responding to derailments and other problems. It’s not unusually to see of one these parked on a siding next to an urban passenger station, along with other Maintenance of Way vehicles. Some of the last cars in use were 280000, but in 1991 the 300000 series was produced by modifying 280000 cars with roller-bearing axles and other changes for reduced maintenance. Production only lasted until 1993, with 500 units produced. These were painted blue, and were used in some specialized unit-train applications, such as transporting newsprint rolls to urban printing plants. 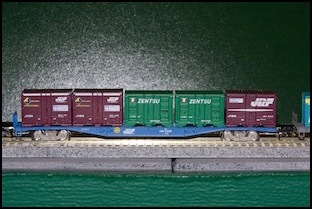 Aside from the color, in photos these look identical to the 280000 series except that the axle ends are round rather than having a square journal box, and again are marked as “WaMu 80000”. In 1998 some 280000 series cars (90 of them) were modified for wood-chip transport by cutting a square hole in the roof and adding a “tilt door” on the sides for dumping the chips. These were painted red. These operated in Hokkaido I believe and probably wouldn’t be seen near Tōkyō, and in any event were retired in 2008. Note: the six-digit number is used for the car numbering, but the series number written in smaller print near the end of the car remains 80000 despite the changes to the design. Increased competition from trucking, coupled with some mis-steps by the Japanese National Railway in the 1960’s as they began to introduce domestic container service largely eliminated the less-than-carload freight business by making it unprofitable for the express companies and uncompetitive for other shippers. As more and more freight shifted to roadways or containers, freight classification yards became underutilized. In 1970, only 48% of freight traffic required the use of marshaling yards. As JNR’s financial situation worsened these began to be closed. In 1984 JNR closed all remaining freight marshaling yards, ending the need for all but a small amount of non-unit freight trains. This did not end all non-unit freight, as some smaller yards remained, and cars could be taken directly from source to destination. An odd side effect of this was that the simple two-axle boxcar, or WaMu, remained in use as the high-speed truck-equipped boxcars, or WaKi, intended to succeed them on express freight were retired. The remaining WaMu were largely used for specialized source-to-destination trains, such as for carrying newsprint from factory to printing plants. 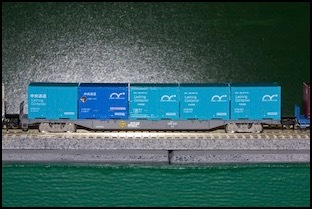 Mostly these are seen formed into unit trains of blue 380,000 series WaMu, although sometimes these will be found mixed with older brown cars and in mixed-freight trains. 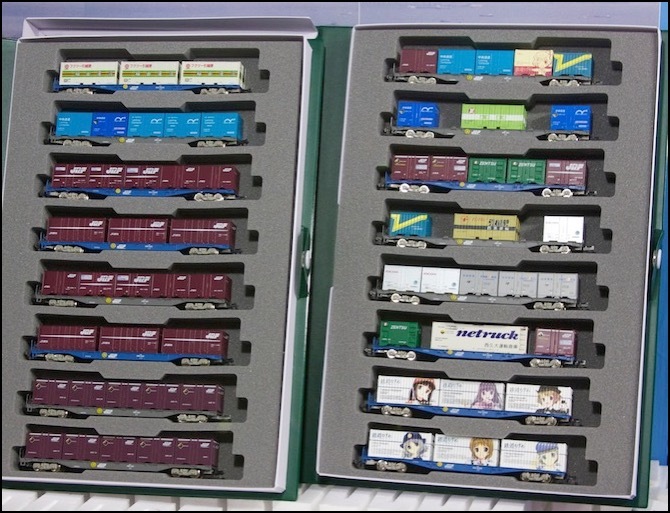 The era of the boxcar is over in Japan, the last unit train apparently running in 2012. Still, no early 21st century layout would really be complete without them. I acquired a dozen: four single Tomix models (2715) and four Kato two-car sets (item number 8033), to create such a train, but discovered that the Kato and Tomix models are substantially different in size (both may represent different prototypes, as the WaMu had a lot of variation over the years, but I’d thought all blue cars were the same size; in any case, they do look odd next to each other and mixing them in one train isn’t a good idea). Both have prototypical markings, although Tomix is a slightly closer fit for photos I’ve seen. Neither has the grab irons painted white, which they should be for this series. Both do have correct roller-bearing (circular axle end) trucks. Notice the size difference: the two almost seem to be different scales. The Kato model is 60mm long, 19mm wide, and 26.5mm tall (railhead to roof peak) with a 25mm door, while the Tomix is 59mm in length, 18.5 mm wide, and 24.5mm high, but also has a 25mm door. Both have a wheelbase a fraction over 35 mm. 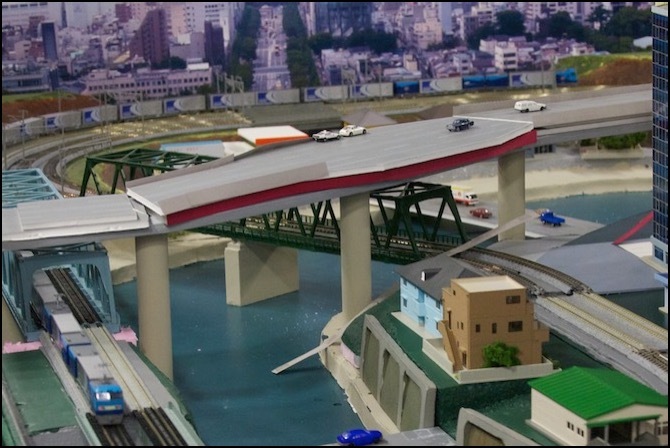 Based on the Japanese wikipedia page, maximum sizes should be 9650 mm L x 2882 mm W x 3703 mm H, or in 1:150 N-scale 64.3 mm L x 19.2 mm W x 24.7 mm H. The wheelbase is 5300 mm, or 35.3 mm. I couldn't find door dimensions. 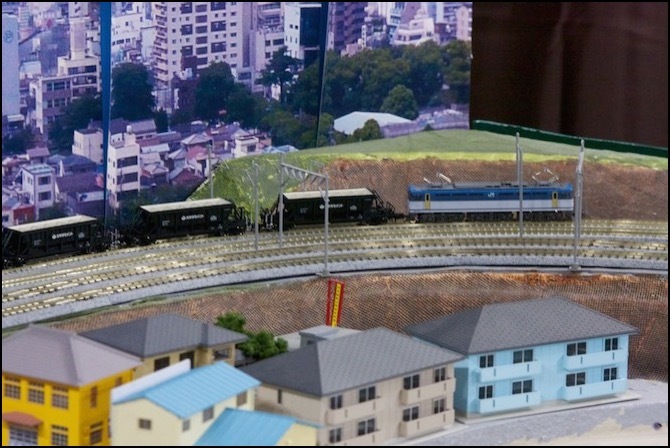 Neither of these is thus correct, although I think the Kato is closer and the Tomix almost seems to be 1:160 scale in length, but correct in height and wheelbase. 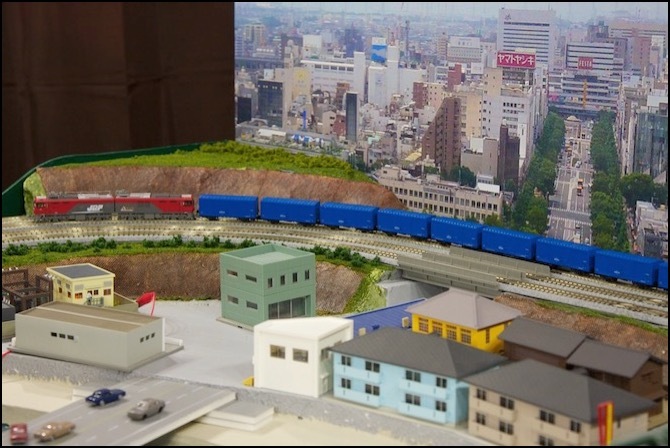 I prefer the Kato model, which I think captures the crisply rounded ends of the vertical corrugations on the side better (see this prototype photo). But the Tomix may have a more realistic profile. I’ve ordered more Kato models to fill out the unit train with all one style, and will likely repurpose the Tomix models for use in a mixed-freight train. Ref: Transition of Railway Freight Transport in a Competitive Market, Kiyoshi Okada, JRTR vol. 5, July 1995. A Schnabel car is a specialized type of very-heavy-duty flat car, designed to carry large electrical transformers, pressure tanks, and other solid objects. In the JNR/JRF classification these are known as “ShiKi”. To maximize the size of the object that can be carried, some Schnabel cars eliminate the middle, using the load itself as the structure between the two ends. One example is the Shiki 600, which was built in 1960 for Fuji Electric, and remained in use under a variety of owners until it was scrapped in 2002. In use, it was typically accompanied by a pair of YO 8000 cabooses for railroad and manufacturer staff accompanying and monitoring the load. I have a Micro Ace model (A8570) which includes a pair of YO 8000. Coal cars are another form of unit freight train. 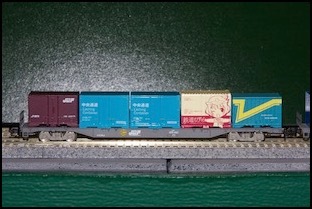 This one is based on a train that runs from the port of Tōkyō to a pair of inland cement factories, where the coal is used to power a factory. The train departs the city with 20 cars, but is later split into two ten-car trains to different plants. The cars used are 35-ton HOKI 10000 hoppers, a relatively recent (1980) design. 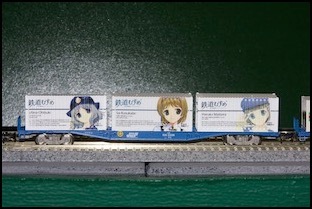 This is a particularly interesting train, since it runs from the Kawasaki port just south of Tōkyō through the urban area using the Yamanote Freight Line (a line heavily used for passenger trains now, but still used for freight), and thus passes through Shinjuku station, the world’s busiest passenger station. 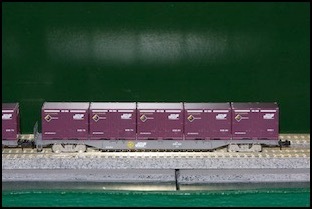 I bought two limited-production sets of ten cars to make up a typical 20-car train (I’ll ignore the duplicate numbers). These were produced by Kawai, which has since gone out of business. Its products were acquired by Ponpondetta, which re-issued the model in 2013 as expensive single cars in a limited set of numbers, although even these were listed as sold out when I checked. A small number (14) of these cars were converted for limestone use and kept their original appearance and numbering, so with a change of cargo you could use the same cars for a second type of train.